Do your freezie pop holders have an odor to them, which was mentioned in a few of the online reviews? Ours do not have a smell to them at all. I even stuck my nose down in there just to be sure. :) I do take a little extra time to wash ours thoroughly (both by hand and in the dishwasher), so maybe those reviewers aren’t washing out all the food bits well enough? One reader suggested using a small bottle brush to get them clean at the very bottom, and I happen to think that is a brilliant idea! What do you fill your molds with? I mostly fill ours with smoothies…either a version of our standard “Fruit Smoothie” or “PB&J Smoothie,” which is actually sometimes a “Sunflower Butter & Jelly Smoothie” since my older daughter goes to a nut-free elementary school. You could also fill them with plain yogurt that’s been sweetened with “Berry Sauce” or fruit and honey. And applesauce is another good option as well. Once they’ve been filled we put them straight in the freezer. 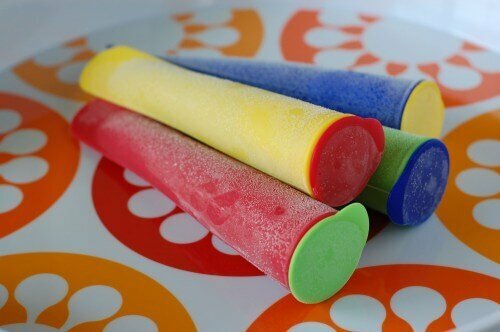 When you put these freezie pops in your daughters’ lunchboxes are they thawed by lunchtime? I take the frozen smoothie pop directly out of the freezer and add it to my 1st grader’s lunchbox at 6:30 A.M. (yes, the day starts early around here!). I usually add at least 3 ice packs to her lunch bag as well. By lunchtime, which is at 11:20 for her, she tells me it is mostly thawed with one or two hard chunks still in the middle. Funny story…the first time I sent one in my 4-year-old’s lunchbox the icy chunk in the middle caught her off-guard because she told me she thought it was a rock in there. I assured her that mommy would never put a rock in her lunch so ever since then she has eaten it worry free. LOL I also want to mention that both of my daughters eat these freezie pops completely solid straight out of our freezer when we are at home. 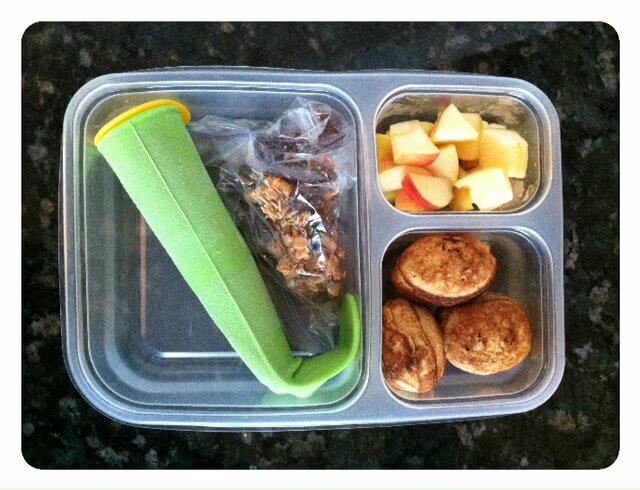 How do you keep the lids on in the lunchboxes? I put their lunches in a plastic (BPA-free) Ziplock divided container, which is very similar to the Easy Lunchbox containers which can be found on Amazon. I fold up the bottom of the freezie pop mold, wedge it into the biggest compartment, and then of course secure the lid. This keeps the top from coming off the mold and also keeps it from moving around. I also tell my girls it’s important to put the empty mold (and top) back into the plastic lunch container with the top back on to avoid any mess in their lunch bag. You could also fold up the bottom of the mold and put a rubber band around the top and bottom long ways (and then put it in a Ziplock bag) to ensure it stays together. I also want to mention that one reader told me her kindergartner’s freezie pop made a little mess in her lap at school (poor thing). For the younger kids it might help to “practice” with partially thawed pops at home first so they know what to expect come lunchtime. In a couple months the pool might just be the perfect place to practice. And speaking of, I learned last summer that both of my daughters absolutely loved having (partially) frozen smoothie pops as their snack up at the neighborhood pool. I kept them in a cooler with ice packs of course, but they were the perfect outdoor cold “treat” on a steaming hot summer day. Anyway, I hope this little FAQ clears some things up for those who are considering buying a set of molds (or for those who are trying to figure what to do with the ones they ordered!). If you have any other questions or tips please share in the comments below! Hi there! I was super excited to try these ice pop molds in my daughter’s school lunches this year, because she loves “Gogurt” but I wanted to make it from scratch. So disappointed! The lid comes off VERY easily and leaves a yogurty mess in her bag every single day! How do you keep the lids on? Bonnie, not sure if anyone responded to you yet, but I saw another reader mentioned putting a big rubberband over the top and down to the bottom. I haven’t tried it yet, but plan to as soon as I send a lunch with these molds. Hi there! I was also excited but the do leak – easily – my middle schooler said it leaked out all over her lunch bag. I guess what you are all saying in your comments is that they are better in a container like the picture or secured by a rubber band? My set just arrived, but there are no instructions. How do you clean yours? I’m hoping they are dishwasher safe! When you freeze smoothies, do you always use fresh fruit? I usually use frozen fruit to make my smoothies and I’m wondering if it’s safe to freeze them after they’ve been blended? Aren’t you not supposed to “refreeze” frozen stuff? I have the same molds as you have as well as some reusable pouches and reusable popsicle sticks and now I’m wondering how to safely use them. Thanks for all the amazing ideas! Thank you so much for these silicone container suggestions. Had no idea these existed and this will be a great middle of the week lunch for my 6th grader to change up the pace from sandwiches a bit. Bought us a 4 pack of these today and going to give them a try this coming week! I’m sorry, I started reading this and screeched to a halt at “nut free elementary school”. Now I’m too distracted to finish. Nut free? The whole school?? Since nuts are such an important and healthy part of a natural diet, the though of banning them in an entire school shocks me. I’ve never understood why non allergic children should change their diets to accommodate the few with allergies. I’ve seen several lunches (packed by parents, NOT eight year olds) that contain a snack cake, chips, a sugary drink and candy. Surely THIS is much more a public health hazard than a handful of walnuts. I can only shake my head…. This is just lack of understanding on your part (I hope)”…Iâ€™ve never understood why non allergic children should change their diets to accommodate the few with allergies…” We are talking about protecting a life here. We are not talking about a rash or upset stomach. I happen to have one of those “few” children you mentioned. And if she ingests even a trace amount of nut she will DIE without intervention. (Which by the way, can mean something simple like a child with a peanut butter sandwich not washing their hands after lunch, then touching the monkey bars at recess and transferring residue. Next thing you know my child follows behind and later rubs her eye or nose – and anaphalaytic shock just like that) The unhealthy food parents pack in school lunches is a separate issue here, and I agree that there are some extremely poor choices made in that area by parents. But that is not a public health hazard. It doesn’t pose a risk to other children’s lives. And certainly I would hope that parents would be much more in favor of forgoing a few nuts during school hours rather than put any child at risk of death. There are many, many healthy options for school lunches. Leaving nuts out during school hours is not a crisis and does not make people pack those processed foods you mentioned. Again, we are only talking school hours so the rest of the time your child can have as many nuts as desired. Please think about this and see the bigger picture of protecting these sweet kiddos before they are able to adequately protect themselves. You would want the same if it was your child you were trying to protect. I purchased these containers and while I like the idea, I’m really struggling with the mess that can come with it. Yesterday 3 tops popped off and the smoothie spilled all over my freezer. I was a bit frustrated because it took me some time to clean up. How do you place them in the freezer so the lid doesn’t come off? Do you fill them 1/2 way up? I’ve been filling them so there’s only room for the lid, and I’m wondering if that’s my mistake. Any other suggestions are appreciated. I bought these. But my son says most of the time they leak all over his lunch box. I’ve tried putting less in, and I tried folding them while the freeze but no luck. Any tips for freezing/packing these? We’re having the same problem but I think I’m going to try the rubberband idea! We are filling my daughter’s with Shakeology so that she can get a boost of super food in the middle of her Kindergarten day and I also really want her to have it to keep her full longer in the afternoons. Thanks for the ideas! Thank you for all these great ideas. You blog has been a lifesaver to me with 4 kids, as we have made the switch over to whole foods. I bought these freezer pops and everything else for my eldest two girls to take for their lunches. We done some school trial runs already and I don’t know who is more excited about school lunches them or me! They are excited to help put it all together. I’ve been panicking a bit as school creeps closer as to what I will do for their lunches. You have all the answers for me. Thank you for helping my family. My little girl is 18 months and attends daycare. They do not provide lunch, which I actually like because it allows me to control what she is eating. However, she is now in a nut-free class due to a child with an extreme allergy so we are back to square one in packing her a lunch! Peanut butter was a fantastic option to get some protein into her lunch, as she is not yet a huge fan of meat! I also freeze halves of avocados in zip-top bags. I put them in her lunch container and by about 11:30, it just needs 10-15 seconds in the microwave to make it soft. She will eat every bite! Anyway, about the smoothies… I am going to try something slightly different this weekend that some of your readers might find helpful. Since my little one is too small to manage a popsicle by herself, I am going to freeze smoothies in ice cube trays. Then I will put a few cubes in small containers and they should come to a soft consistency by lunch time. She should be able to eat it with a spoon – much like yogurt with fresh fruit puree mixed in. Just an idea! Re: silicone pop mold odor problems: From what I’ve read, it is only the cheap, low-quality silicone that gives off the offensive odor. The high-quality molds don’t seem to have that issue. No cleaning methods or agents will remove it. What do you guys think of seemingly healthier alternatives to juice boxes, like GoGo Squeez and Fruit.0? I stopped using the sugary zero fruit sippers like CapriSun and switched to these a few years ago. My daughter loves them (in spite of herself) but what is your take? I do make the occasional smoothie but these are obviously easier and more convenient. Every time I have tried this, by lunchtime they have expanded and when my son opens them they literally explode. We use this at least 2 days a week. My husband even takes them in his lunch sometimes! We’ve never had a leak or a mess. And I don’t use a rubber band or put it in her lunch container. I usually just slide it in alongside her ziplock container. I’ve noticed once I fill it, I stick a straw down the middle to get all the air out, and then once the lid is on I pull on the side of the tube, near the lid, to let any more air out. The suction from that seems to really seal the tube. FYI, i wanted to share with you a handy trick i use as an ice pack in the cooler, i fill the organic broth cartons up with water and freeze them, they freeze into blocks that stack well in the cooler, and use the water for dish washing when they thaw out. I just bought these for the kids and wondered about the leakage in their lunchbox. So, last night I told my kids we would do a test at home first before I send them to school. This way they’ll know how to use them and hopefully won’t make a mess at school. Thanks for this great FAQ — answered all the questions I had! What brand of these freezer tubes are you using? I see Amazon has a bunch of different ones. Hi Erin. Just click on the words “reusable freezie pop molds” in the first sentence of the post and it will take you to the ones that Lisa purchases. Hi Mary. Freezing is not as worrisome as heating in plastics. However, if you are concerned about it, I have seen stainless steel freezer pop molds. I found some similar molds at IKEA. I haven’t used them yet, but they were inexpensive. The reviews on Amazon say that they are not 100% silicone. Is that true? Hi Sue. You would need to check with the company. It is possible that they have changed their formula. My 3 year old is starting preschool next week and she will have a refrigerator and microwave available in her classroom. What do you recommend I do with the freezer pop to defrost in time for lunch at 11:30? Will it defrost in the refrigerator to the consistency that a 3 year old can eat or should I set it in the refrigerator the night before? Thanks! Hi there. Lisa just allows them to defrost in the lunch box. I was super excited to send these in my son’s lunch as he is a picky eater. He said when he opened his lung bag it was all over! Someone helped him clean it up. Does anyone have this problem? What could I have done wrong? I used strawberries, banana and greek yogurt to make a shake. The left over shake went into the molds and in the freezer overnight. In the morning I took from freezer into his lung bag. Thanks for the help. I love your website. Hi there. Here’s the low-down: https://www.100daysofrealfood.com/2012/03/19/real-food-tips-4-hints-for-using-freezie-pop-molds/. I love your BLOG! I would not be able to have 100 days of REAL FOOD! I LOVE your video it really explained how and why you do 100 days of real food from sydney!